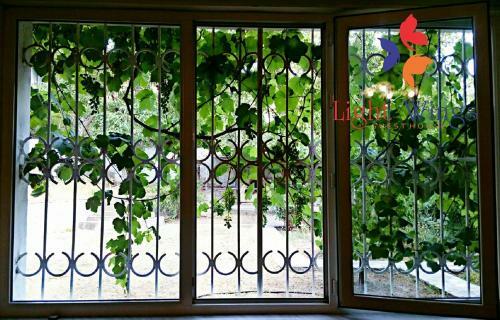 Hostel Light Wings Guesthouse is situated in 9th Aygestan st. 89 in Yerevan only in 2.5 km from the centre. Travellers can take advantage of a huge range of amenities: WiFi available everywhere, convenient airport transfer, 24/7 front desk, a meal may be served in the room, comfortable non-smoking rooms, special diet menus(on request), BBQ facilities. Please note that payment for the accommodation and amenities is possible only in cash. Staff is fluent English, Italian and Russian. For you, it is proposed 2 rooms in the hostel. Tourists can easily choose between different types of rooms: triple, twin. Of the amenities, there are air conditioning, hairdryer, hot tub, refrigerator, desk, ironing facilities, free toiletries. You will enjoy a garden view from your window. We also provide unique facilities for guests: patio, fireplace. Amazing owners - they treat us as like a members of family. Great breakfast made by owners wife. Mostly from home made ingridients. clean rooms and comfy beds. The personel was really really nice. The rooms were huge and spacious. Bathroom was really nice. They provided a parking spot in the yard. The breakfast included in the price was just delicious! we had not daily service room. Raphael and his family were very friendly and helpful. The location was good and the fresh food from the garden was delicious. I highly recommend this guesthouse to anyone visiting Yerevan!